Below are photographic copies of part of chapter three of the gospel of John from five KJV Bibles spanning a period of four centuries. Note that the text in all copies are identical, with the exception of spelling and punctuation: all of the corresponding words have the exact same meaning. Heaven and earth shall pass away, but my words shall not pass away., our Lord Jesus Christ exclaimed (Matthew 24:35; Mark 13:31; Luke 21:33). And the words that I speak unto you, they are spirit, and they are life. (John 6:63), and In the mouth of two or three witnesses shall every word be established. (Matt. 18:16; II Cor. 13:1). Our Lord told his apostles, But the Comforter, which is the Holy Ghost, whom the Father will send in my name, he shall teach you all things, and bring all things to your remembrance, whatsoever I have said unto you. (John 14:26). The apostles of our Lord established his words in the first century, and faithful Christians copied and recopied the Sacred Scriptures from one generation to the next. [T]he words that our Lord Jesus Christ spoke unto us are forever recorded and written for his people to be able to read and know his truth. All scripture is given by inspiration of God (II Tim. 3:16); and whatsoever things were written aforetime were written for our learning, that we through patience and comfort of the scriptures might have hope. (Rom. 15:4). From the time of the Old Testament prophets and the New Testament apostles down through the centuries the overwhelming majority of Bible Manuscript evidence is in agreement with the text of the English Authorized Version of 1611, known today as the King James Version Holy Bible. The King James Bible has been revised four or five times since 1611, the latest revision occurring in 1873. A careful comparison of a 1611 edition with any (un-corrupted) KJV today will readily put to rest this fallacy! 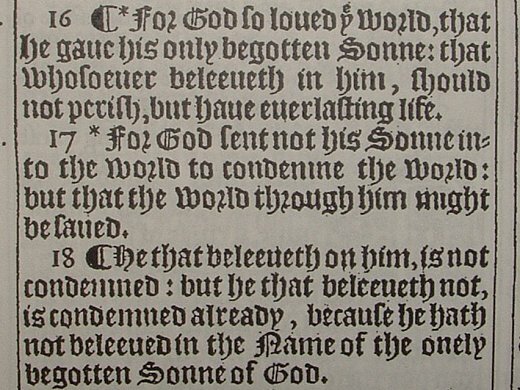 Due to the Gothic print and early forms of spelling the 1611 KJV cannot be read nor understood. Any twelve year old with Middle School (4th to 5th grade) reading skills should have no trouble reading it! Sometimes the word "the" was printed in this manner to save space. The word "and" was sometimes printed as a small double crossed double line to save space. The letters "m" and "n" were sometimes omitted from the end of words, and indicated by a mark over the preceding vowel. Two styles of the letter "s" were used; this is why a lower case "s" sometimes resembled a lower case "f". Two styles of the letter "r" were used; notice the "r" in the words "for", "whosoever" & "record" (Exodus 12:15; 20:24, John 3:16, etc.). The letters "j" and "i" were printed the same in both lower and upper cases. When a lower-case "u" or "v" was at the beginning of a word it resembled a lower-case "b". The letters "u" and "v" were often interchangeable; this is why we call a "w" a "double-u" and not a "double-v". Text of a KJV Bible printed in 1611. 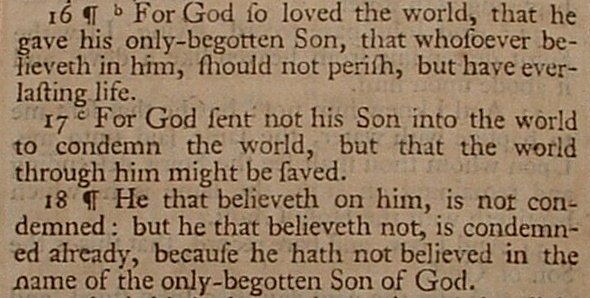 Text of a KJV Bible printed in 1761. 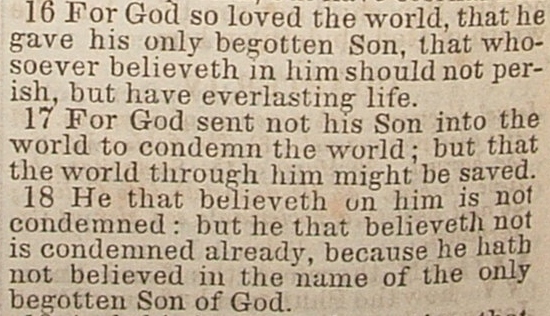 Text of a KJV Bible printed in 1863. Text of a KJV Bible printed in 1906. Text of a KJV Bible printed in 2004. Jesus Christ the same yesterday, and to day, and for ever.(Hebrews 13:8). God's Promise To Preserve His Pure Words! NOTE: The scriptures below give us strong reassurance to know that we have the real word of God, just as our Lord intended us to have! Biblical English of The KJV 1611 - "Archaic Words"?